My mother had decided to make a quilt for each of us and had started mine before she went to her final home. It is a double wedding ring and she had the entire king size quilt cut out (by hand) in the bin with the partially assembled top. I have pulled it out several times to look at it, but recently when I decided to finish it (after 15 years!) I see that it has several problems. My mom was a wonderful seamstress and quilter, but in her final years she didn't see as well and must have been struggling to sew. The seams aren't sewn well and there are even a couple of holes where she missed the fabric totally. I always planned to finish it one day, but now I'm trying to decide what to do with it. I really don't want to rip out all she had sewn. Maybe I could make a wall hanging? I'm looking for ideas. I would finish the quilt with all the little imperfections. It is a sentimental thing. Something your mom started and you finished. Nothing in life is perfect, why would quilts have to be perfect. If she got to finish it you would have loved it even if it had a big gaping hole in the middle, right? Because it came from your mom and it was made with love. Depending on how frustrating or relaxing working on it is for you, I think I would make a wallhanging or a pillow. If there are others in the family who have not received a quilt from your mother, you could make something small for them also. I would rip out just the parts where there would be holes. And try to finish it, possibly a little at a time. For me ... I would make what I wanted. Probably as a quilt if I really liked it. I framed a petit point cushion cover my Mom had made back when she could see. It hangs in a place of honor in my living room entry way. Why? because as a pillow it wouldn't last and I didn't need any more pillows. I just wish she would have signed the matting for me. I am in the same situation. My mom had started a Double Wedding Ring, and I inherited it. I don't think she was happy with it and did not work on it often. It is about a fourth done. Someone suggested to finish it as a bed runner, you know those small quilts that sit on the end of a bed, but I have not pulled it out to look at it. I will be watching this post. My sister started a quilt and then passed away. I finished it and then tried to give it to my brother but he already had two quilts from me so I gave it to my daughter. Now she has a one-of-a-kind quilt from my sister and me. I would fix it if it bugged me. If I could live with the imperfections, I would applique something where there were holes and call it good. I would finish it just the way it is. She put a lot of work in to it and its so pretty. I agree. It is a beautiful quilt. I would finish it, fixing whatever I needed to, and then I would use it. Oh what a beauty!! I would finish it. She sure put alot of work in to it. Its a beautiful family heirloom!! It looks like a lot of pieces are already sewn to make up more blocks, so if at all possible, I would finish it. I wouldn't want holes, so I'd either re-do those areas, or applique over the holes, as someone else suggested. The quilt is really lovely, and I think you will cherish it once it is finished. As a ufo, how much are you really going to appreciate it? Also, if it remains in pieces, someone in the future may just trash it all, not knowing what it was or what it really meant to them. Once it is a finished item of some sort, you can attach a label to it so descendants will know what it is. I agree with mic-pa and Dina. Fix what you can (or want to) and finish it the size it is. Are there enough pieces in the box to make something for the others she meant to make a quilt for? what if you patched the little holes with white fabric on the back. I love it.. I would hand patch the white holes and then leave a story about it on the back fabric...then who ever ends up with it after you will know why some holes are in it..
Ih, it is so beautiful. Please finish it someway!!!!!!!!!!!!! How about appliqued hearts over the little holes? The hearts would show that she made it with love...even if it isn't quite perfect. This may not apply to the situation above, but a quilter had left behind some unused pieced blocks. One of the quilter's daughters or a female relative used them as appliques in different quilts which were then given to relatives. I saw an exhibit of them in a show a few years ago. It was nice. Oh golly! That quilt is beautiful. PLEASE finish it. Rip out what is loose and re-sew it. You won't be sorry. There is a ton of work put into it. I have 2 that my Mother-in-law made. Wouldn't part with them at all. Just a little at a time, so you don't get worn out or tired of working on it. That is a beautiful quilt your Mother began. She probably didn't get it finished as it was a lot of work and time consuming. We all get burned out on some of our projects. Maybe she did on that one. Finish it. Fix the seams where the fabric was missed entirely. Also, it might help to iron the seams open and SITD on both sides of all seams when quilting to help stabilize the seams. I agree with Tashana. On the label you could reference your mother like "This quilt was to become a loving memory for a daughter by her mother, but was finished by the daughter in loving memory of her mother." You could insert your names and approximate date started and then the finishing date. Leave your mothers stitches in and finish with yours. I wouldn't rip one stitch out. Every time you look at that quilt you can point out to everyone which stitches she lovingly created for you. I would look at each stitch as a gift from her heart to yours. Very pretty quilt. Good luck. The quilt is very pretty! I would finish that quilt as she intended, flaws and all, and I would regard it as an absolute treasure! It is a beautiful quilt. I agree, fix what you can and finish it! I'd fix what needs fixing and then finish it. That's what your Mother was trying to do (I'd guess). 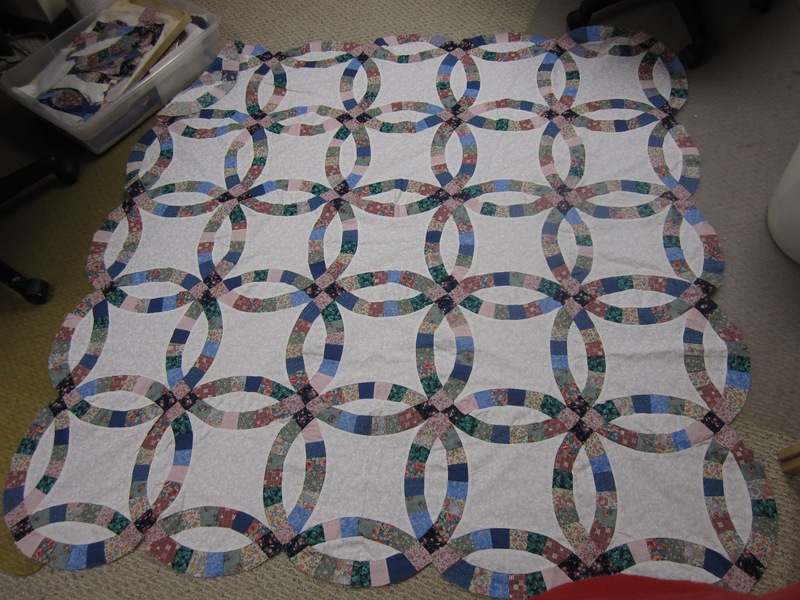 Before my Mother passed away, she had given up on her quilting as it wasn't turning out right. Alzehimers is a cruel thing for people to endure. At one point, she handed me a quilt top she had been working on and said.."here, you finish this cause I can't make sense of it."